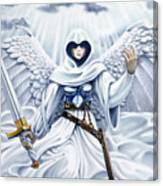 Avenging Angel galaxy s8 case by Melissa A Benson. Protect your Galaxy S8 with an impact-resistant, slim-profile, hard-shell case. The image is printed directly onto the case and wrapped around the edges for a beautiful presentation. Simply snap the case onto your Galaxy S8 for instant protection and direct access to all of the phone's features! Thank you for replying Ms. Benson! I have to say I am a big fan of your artwork. Very beautiful and vivid. I remember when I saw the original for sale and wish I had the money at the time so long ago. I have never commissioned an artist before but I will definitely look into that and try to figure out what I would like to do. This is one of my favorite paintings of all time. Hello Jay, The original of this is long gone. In fact it was up on eBay recently and sold for much more than I asked for it initially. These are prints. 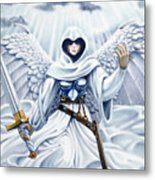 However, if you are interested, I have done several recreation commissions of my Magic cards. I would be happy to do this one for you. This way, you would have an original piece of artwork. Most people want the recreations larger than the originals because they were about 6 x 7 inches. You can get more information on my website (http://www.melissabenson.com/commissions/commissions.html) , see some pieces in the gallery (http://www.melissabenson.com/commissions/commissiongallery14.html) and read some testimonials from some very happy clients (http://www.melissabenson.com/commissions/testimonials.html). Let me know. I have been looking all over, is the original piece for sale? or just prints. I missed the chance to buy it from Melissa Benson directly and and searching. Please email me at lacunaserenity@gmail.com and let me know. Thank you very much! 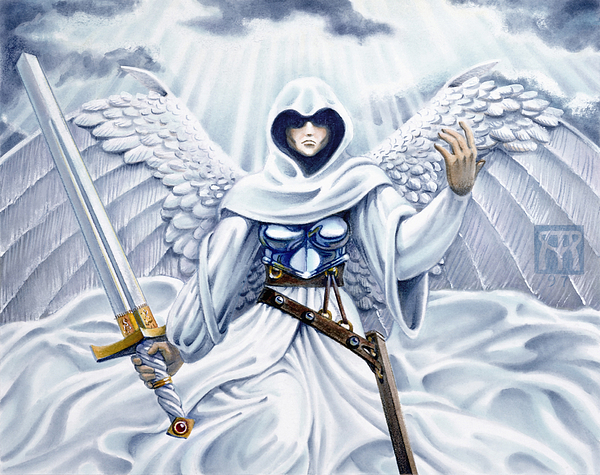 This is card art for Angel of Mercy from the Portal 2 edition of Magic: the Gathering. 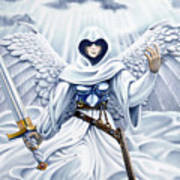 Holding a massive sword, this angel all in white with wings outstretched beckons you to closer.